Cape Cod’s Offshore Wind Farm: Yay or Nay? The Obama administration has given the green light for an offshore wind farm to be built off the coast of Cape Cod, Massachusetts. Once built, 130 wind turbines will stand in the water and harness the power generated by the stiff winds coming into the coast, tapping a clean, reliable, renewable energy source. But is this a good idea or a bad idea, environmentally speaking? Let’s take a look at the pros and cons. It’s not exactly cheap — estimates put Cape Wind, as the project is called, at $1-$2 billion. It would alter (some say ruin) the view from certain seaside spots in Cape Cod. 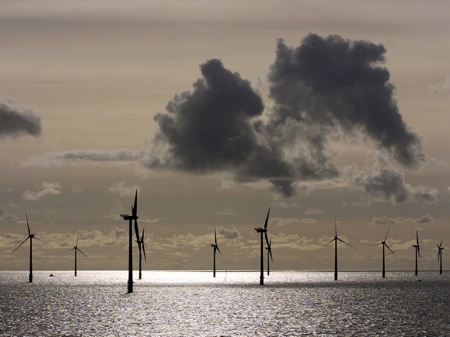 The wind turbines would disrupt marine life and possibly endanger birds. Some predict it will open up the wind power industry to more lawsuits and setbacks. Two Wampanoag Indian tribes have claimed the wind farm would disrupt one of their sacred rituals, which includes an unblocked view of the sunrise over Nantucket Sound. Also, the turbines would be built on top of ancient tribal burial grounds, which have long been submerged. Cape Wind could provide three-quarters of the power supply to Cape Cod’s 225,000 residents. It could start generating power as early as 2012. It will create green jobs in the area and possibly provide a jump-start for more wind farms nationwide. The closest turbine to the shore would be five miles offshore, meaning on a clear day, the turbines would be about a half-inch tall on the horizon from the closest point on the shore, and only visible as tiny specks from Nantucket. Nothing is final yet — there are likely many more court battles to be waged before any turbines go into place. Politics aside, the real question for environmentalists is: Do you support this? The disruption to marine life and birds is a valid concern, environmentally speaking. On the other hand, more energy produced by wind means less drilling for oil and fewer mountaintops being blown up to get to the coal inside. As with all environmental issues, there is always a trade-off. Wind is a clean, renewable energy source — that is a fact. But do the pros outweigh the cons? Even if they do, are the cons too big to ignore? I’ve tried to keep this post focused on the environmental aspects of this wind farm, but the politics are inextricably intertwined with Cape Wind, and I want to open up the comments to any and all views on this. Please leave us a comment explaining your feelings on Cape Wind. Noelle scooped me, and she’s funnier anyway. I was struck by the timing of this decision, coming just months after a decision to allow more oil and gas exploration in offshore areas. So we could have drilling platforms on the continental shelf or we could have wind turbines. Which is what Noelle already said. And for the Cape Cod area folks: NIMBY only works if you’re willing to take yourself off the grid. Your electricity is coming from somewhere, so maybe you should suffer some of the drawbacks. Folks in mine-ravaged Appalachia might agree with me. I don’t mind the look of them at all so the whole “altering the view” argument wouldn’t work for me (except for the Natives and their culture/traditions). I guess you have to look at the alternative to not having the wind farm and what the environmental impacts of that energy source are. I think anywhere you go with the wind farms, someone is going to say ‘not in my backyard.’ Does that mean we should or shouldn’t? I don’t know. I guess we need to weigh them against the impact the alternatives, like coal power, nuclear power, hydro power, etc., have. I personally would like to see more wind power, but sensitivity is important too. I’m glad you wrote about this. I heard a news story about this that mentioned “surrounding controversy” and I was curious just what was so controversial about an off-shore wind farm. It sounded like an excellent plan to me! Alas, my enthusiasm was short sighted. I still think it sounds worth the trade-offs, but then, I’m not the one with an ancestral burial ground there. Tricky. Good comments, all. Yes, this is called progress, and progress comes at a price. There is a downside to everything; the right decision comes down to picking the lesser of two evils. I’m leaning toward the pros outweighing the cons, but that doesn’t mean the cons are going to go away. It bugs me when people complain about how new technology ‘ruins’ the natural landscape. We cannot keep everything completely 100% natural, the more we try to preserve everything ‘the way it is and always has been’ the more we are going to destroy our natural environment. Our environment can no longer sustain our way of life. People must realize that things are going to change and technology is going to become part of our new ‘natural’ landscape. It has it’s own beauty. I had concerns about migratory birds colliding with turbines but the Audubon Society supports the project as does the NRDC. My parents live on Dauphin Island Alabama and the oil rigs are unsightly but the environmental costs of an oil spill are catastrophic. I’m sure the people there would much rather have wind turbines then oil platforms in the gulf! I also have friends who fight against mountain top removal mining in WV and I’ll bet you they’d rather have wind turbines too. Nobody wants to have their view shed changed but I think this is a much cleaner solution then oil or coal. It’s also less detrimental then building dams. I conserve as much as I can but still couldn’t live without energy so we have to get it from somewhere and right now this is one of the cleanest and best solutions. Pingback by Oil Spill: How Can You Help? how about a nice sun set? forget it it will be lost to blinking lights and 400foot towers. I’m 4th gen born and raised cape cod. These monsters are turning us into a busteling city and its happening right infront of our eyes. I understand that you think it will be more eco-friendly but ask yourself this, What happens when the tourist decide to go elseware and we commecalize the cape to stay alive. with that bringing all the things that go allong more crime and more drugs. Do you see what I see cape cod? all the land being swallowed up by mc’mansions and condos. i mean realy THIS IS THE CAPE. This is the place we love. the small communities knowing your neighbors and not locking your doors. Even as I type it is all being stolen away from us, but you turn a blind eye. What will our children think?. I would welcome a turbine in my backyard. Serious. But I am to close to an international airport. But i definitely see this as a wave of the future. I was just reading that one project hired the farmer/rancher they put their turbines on as a caretaker for the turbines, saved his ranch, his way of life- so I am guessing he is for it! You say what will our kids say… they will thank us for may reasons..being able to breath cleaner air, the ability to raise their families with a better environment, where families are not dying from the process used to generate the energy we now use. We learn from histiory that change is hard for so many but then we get used to it because it has improved our lives in many ways, unfortunately we find out years later that these ideas hurt our earth, sky and health. Even my 5 yr old grandchild knows that this choice is better for everyone in the long run. I am for this project. The idea that it will be an eyesore for people when it is located 5 miles off shore is just something that they will have to live with. The effects of the power generating plants we now use are indisputably harming our our environment and leading to dramatic climate change. We need to start finding other ways to feed our ever growing need to consume energy and it must be clean. The sooner the better. Use a Bed Warmer Would You Support a Grocery Bag Surcharge? Another Use for Dehumidifier Water The Carnivore’s Dilemma Is Big Green Bad?